This list of React native libraries is not curated randomly from the Internet. These are the libraries that I use personally in my apps. There may be alternatives for these libraries but I chose these after a good amount of research and trying them out in my apps. This library is really good for quickly adding simple animations and transitions to your React Native app. This library can be used in 2 ways – Declarative and Imperative. Declarative usage – Simply mention the name of one of the pre-built animations and that animation will be applied as soon as that element loads. Ex: Heading should slide in from left when a page is opened. Imperative usage – If you want to play animation manually then this method works great. Ex: wobble a heart icon when someone likes a post. You can also define your own animations! For complex animations, I prefer to use React Native’s Animated API from scratch. Check the gif below. Profile page with simple transitions – Profile Image has a zoom in animation, Profile details slide-in left with a delay. Finally, like icon has a small wobble animation when someone likes a post. This library has very good support for Local push notifications. It has features like schedule notification, repeat notification based on day, week, time etc which are not available in other libraries. If your app needs remote notifications sent from the server using GCM or FCM then this library is the one! FCM is nothing but the newest version of GCM. A simple Hyperlink component for react-native that makes URLs, fuzzy links, emails etc clickable. It also has support for styling the links. Just pass a Text Component as a child to Hyperlink component and the library takes care of everything. Showing progress of loading or any other action is important in an app. This library makes it easy to show progress by supporting 5 different components like Linear progress bar, circular, pie etc. React Native swiper is very useful for implementing App intro, Image carousel, and Image Galleries. Share component with UI customizations. It also supports sharing files. An Image component with zoom support, onload callback, scale to fit & scroll indicator support. This component has an issue with high-resolution images. Of course, It’s not a React native specific issue. Memory issues are common on android when there are high-resolution images. Demo for this component is React-Native-Swiper demo above. Another essential library for any app with Image upload or Image processing. It supports selecting from the gallery, Take a photo from the camera. Another useful feature in this library that I loved is the option to select the quality of the Image. This feature solves memory issues due to high-resolution images. This library is just a wrapper around React Native’s built-in AsyncStorage API but It is really useful because of its features like promises, chaining and super simple API. It’s the best Icon component. It comes bundled with 10 Icons sets, Icon-button components and also allows you to import custom Icon sets using glyph map, Fontello and TTF files. This Modal library is built upon the React Native’s Modal component but comes with many customizations and features. It just has all the feature you need to work with Modals in an app. Navigation is one of the main concerns among React Native community because It doesn’t have a default navigation system. Whatever the navigation system that React Native comes up always has breaking changes or is unstable. This library helped me to implement navigation quickly with a very simple declarative API. It maintains a stack of routes and navigation to any scene from any scene in-app is as simple as calling a function. It supports tabbed navigation, drawer and Modals too. Modals can be defined as scenes so that a Modal can be called from any scene. You heard a lot about React-Navigation and wondering why I’m using React Native Router Flux? Don’t worry React Native Router flux v4 is based on React-Navigation and has even simpler API! Most of the app demos above use React-native-router-Flux for the navigation system. If you want to see it live then download our app Helpy built using React Native, available on both Android & iOS. 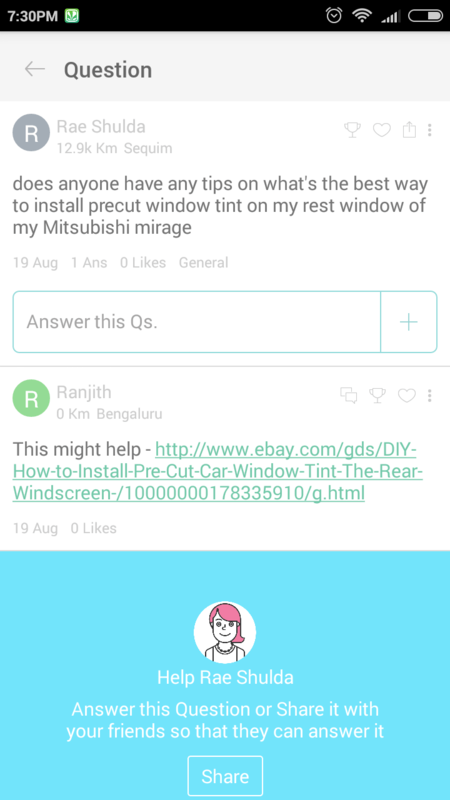 Helpy is a hyperlocal Q n A App. In simple words, It is a simplified and location based alternative to Quora. If you use an awesome React Native library which is not in the above list then let me know in the comments below! Where did you find these sources. Is it necessary to have an Apple device for learning Swift programming language. Yes – went through this one – can you DM me? Send me a message using chatbox in the bottom right. Hey if you don’t mind can you tell how you did the zoomable image inside the swiper? Hi Sanath, I’ve just used React-native-photo-view inside the swiper to allow pinch to zoom. A very informative blog with brilliant content you have posted and useful for all. I’m very impressed for your work so I need to your help about React native. I hope so you have replied me on this email. Hi Vivek, I use Node.js for the app backend. I don’t have an example right now but I wish to make a tutorial on that.